Urban Craft Uprising THIS WEEKEND! And just like that in a blink of an eye we are here. End of June and time for Urban Craft Uprising's Summer Show. John and I set up our booth today. We're doing a shared booth for both of my companies. We'll be there this weekend from 11 am to 5pm. Seattle Center Exhibition Hall booth number 25. This will most likely be my only in person show with my kanzashi this year at this point. Much of my kanzashi work happens during "wedding season" so I've switched to just doing shows during that time frame. Also 6 by 6 eats up 90% of my time. For my non locals, I will freshen up the store post show. Hi there! I've survived a wedding and a large show with my other company 6 by 6 Arts. I'll have lots to post about in regards to our very DIY/handmade wedding in the very near future. But I wanted to share some information about the upcoming holiday season. For the first time in over a decade, I will not be at Urban Craft Uprising's Winter Show with my kanzashi. It is a bit surreal after you're used to an annual event for so long it seems a bit weird to not have that on the list of upcoming events. Honestly, I didn't try very hard to get into the show. This company this year has taken a back burner to 6 by 6 Arts. Not because I'm not interested in my work or have a lack of business, I'm just branching and evolving into new works. With that said, I will be at Urban Craft Uprising's 2016 Winter Show with my other company 6 by 6 Arts. For all of those who have asked me; "Where is my other stuff." Now is your chance! It will be 6 by 6's Seattle show debut. I'm very excited for the opportunity. I will still be making and selling my kanzashi online and at my current stockists. So never fear, your forever flowers are still available, just let me know what you need. For all of my long time customers, thank you so much for the continued support at the UCU show! I hope to see you all this winter, just at 6 by 6's booth this time. Urban Craft Uprising was a pleasure as usual. UCU attendees are faithful and fresh. Each show, I get a new request, a new idea and a new found love for my own work. I also appreciate the people behind making the show happen. The organizers, the volunteers and my fellow makers. Many who have become good friends over the years. John came and helped me all weekend at the show. I'm working this holiday weekend, but I am taking time off too since all of my babies will be home under one roof for a couple days. I gotta get my momming mode on. Happy 4th to my fellow Americans🇺🇸. Stay safe, thank a solider if you see one and have a good weekend! I'm getting prepared for the awesome weekend that lies ahead at Urban Craft Uprising! New packaging, new booth display and new sign. If you've been following me for awhile, you know I have another company, 6 by 6 Arts. I've been asked by customers and as well as buyers who plan to attend the wholesale buyer's day, if I or 6 by 6 will be at the show. We will not be. At this time I am limiting my wholesale accounts for my kanzashi, due to scheduling. 6 by 6 is currently taking new wholesale accounts however, please contact us here for more information and our current linesheet. I love that wholesale buyers have reached out to me directly and plan to attend the unique "tradeshow" experience that UCU is offering! I'll be in booth 18. I believe I am next to a new UCU vendor, Adina Mills. One thing that I absolutely love about the organizers of UCU is that they are fantastic with their placement of vendors. I am an "old timer" at the show and quite often, if not always, I am placed next to a new vendor. I love that! It is a busy weekend in Seattle, so make sure you add Urban Craft Uprising to your to do list! Urban Craft Uprising - Summer Show THIS WEEKEND! It's that time of year again! Urban Craft Uprising's Summer show is upon us, already! My life has been one big blur as of late. I don't blog as much as I used to (obviously), but I do now actively post on Instagram. With IG update for ease of switching between accounts, I make it a point to post more there. I hope to see some familiar faces this weekend! I'd love to get feedback on my new packaging. Which was slightly terrifying to make that change after so many years. According to my last post that is! I failed to post about my booth location at Urban Craft Uprising Winter Show this past weekend. Yet, many still were able to find me there. It was absolutely wonderful to touch base with so many former and repeat customers! I love revisiting my previous pieces. I especially LOVE those of you who made the extra effort to come meet me in person after ordering from me online. The one that got away... this particular flower was admired by two separate people but as any good craft show shopper, you have to do the rounds first before buying anything. But alas, I had to tell both of those folks who returned that someone swooped this up during their rounds. Lessons to be learned at craft shows - if you love it - just buy it! So many things have gotten away from me when I hmmed and hawwed. Thank you so much! Thank you for supporting my fellow craftspeople and the event in general. We are a thriving community because of people like you. I do still plan to list a few more things online, however I am in the midst of preparing to sell my other company's wares at Crafty Wonderland in Portland, Oregon this week! So all of my attention is on that right now. Thanks again to all that stopped by my booth this past weekend! I am filled with gratitude for knowing and meeting the best people through my and other's handmade works. Hi there! I hope my fellow Americans had a great Thanksgiving weekend. We had an excellent one with plenty of leftovers to allow me to not have to really cook for a couple of days. Well, it's here! The week of Urban Craft Uprising. I'm busily packaging things up in preparation. This will be my last show with my flowers for this year. I will have my 6 by 6 Arts stuff at Crafty Wonderland in Portland, Oregon next week. Unfortunately, my laser stuff won't be at Urban Craft Uprising in Seattle. We didn't make the cut. But I will have my Starr Flowers at UCU! Brand spanking new mini ones at that. I only have them listed on Etsy online at this time. I will have oodles on hand at the show this weekend for all you locals. Available in maple or walnut woods and in two different designs. I chose a super grippy alligator clip with teeth for these. Something small should have a good grip so it doesn't get lost in your hair. Also, these clips are versatile! You can clip them onto your lapel, hat, scarf and more. I'm looking forward to the show this weekend! I'll post more about my booth location and specials that I will have at the show later this week. Seattle International District - Night Market this Saturday! Hi there! As I've probably mentioned before, most of my time these days have been spent working on building my other company 6 by 6 Arts. It's been a lot of fun and completely different than what I've been doing here. It's been an inspiration to keep creating new things and refining my established works. I created a few beautiful custom bridal orders during the peak wedding season this year. So much love and wedded bliss in the air! It's been absolutely wonderful and as always an honor to create custom keepsake pieces. Starr Flowers and Mini Kanzashi will be on hand this weekend! I'm making my first appearance this year with my kanzashi this Saturday at the Seattle International District Night Market & Autumn Moon Festival. I will have a select few things from 6 by 6 there on hand. We are also taking orders for on site delivery too. Same goes for here! If there is anything that you're hoping to get your hands on from me, shoot me a note and I'll meet you at the festival! I know there's not a lot in my shop at the moment (*spoiler* - Updates are coming soon!) I do have a few things available in my Etsy shop. I'll be sharing a booth with Momo Seattle! If you can't make it out to the festival this weekend, you can always pick up my kanzashi and Starr Flowers at Momo! They have been a long time stockist and personal favorite shop of mine for years now! I would love to see some familiar faces this weekend! PLUS there's a Happy Hour for the food trucks. Wuttttt!?!?!? Urban Craft Uprising - Summer 2015 THIS WEEKEND!!! Can you believe it's that time again? Urban Craft Uprising's Summer show is this weekend! Did you happen to check out UCU's Meet the Vendor on me? Oddly the two most asked questions of me is: "Is Starr your real last name?" - It is! and "Are those made of clay?" - usually asked prior to touching my kanzashi. 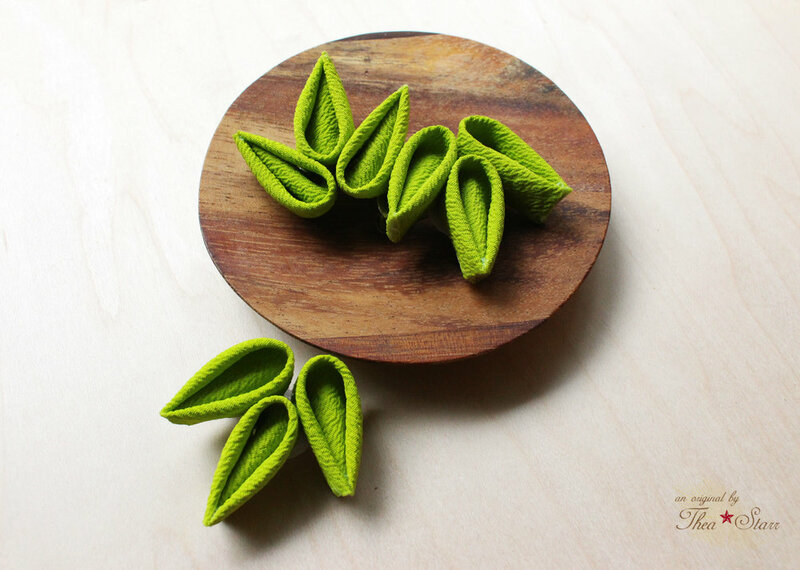 I try to live up to my "Precisely folded fabric flowers" slogan. I have been busy tossing $5.00 scrap fabric bags together, whipping up new $10.00 hair clips and creating unique color palettes for bouquets. I will have many pieces on sale! I'm really looking forward to some familiar faces that usually sing by Urban Craft's Summer Show to grab my sale items. I will also have my new Starr Flowers on hand too! I will be in the back corner at booth #125. Right next to show sponsor and one of my stockists Two Birds Tattoo! Just look for a super colorful display ( I CANNOT WAIT TO SHARE MY NEW DISPLAYS WITH YOU!!!) and you know you've found me.